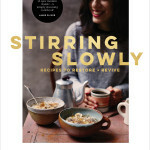 Home / Lifestyle / WIN a copy of Stirring Slowly! 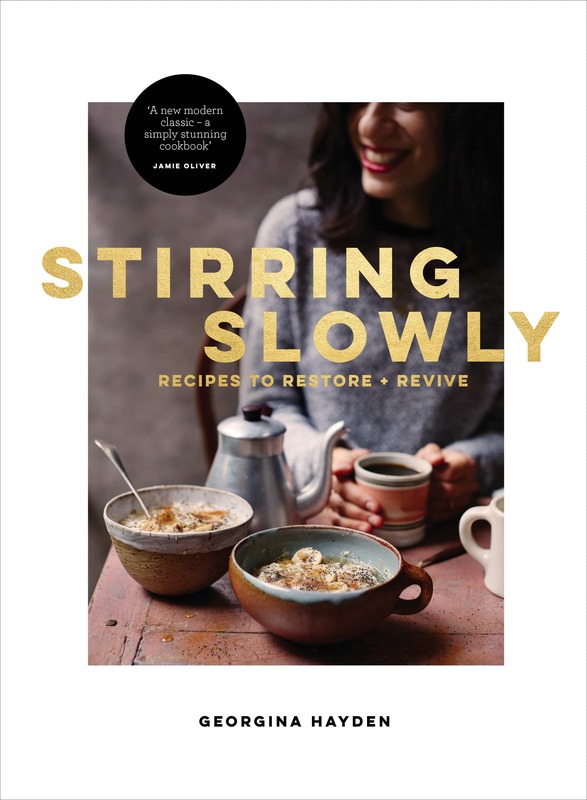 I am super happy for the release of the stellar new book Stirring Slowly! July is the month talented food stylist and writer Georgina Hayden releases her debut cookbook. A book that celebrates the joy of cooking, savoring every moment, taking time in the kitchen putting together a meal which will restore, nourish and revive. The book reflects Georgina’s visual eye and love for travel which has inspired many recipes. For me its visually appealing with recipes that can be part of our everyday life. And even more special seeing her love for spices with so many delicious Indian recipes that celebrate the cuisine. You can revel in an Indian spiced omelette, slow cooked black dal, khichdi and (my fave!) no churn chai ice cream. Chapters include quick & light, hearty comfort cooking, bowl food, a chapter celebrating vegetarian recipes and ending with a glorious section of scrummy cakes. I have made the British summertime stack recipe; which includes strawberries, meringue, cake and pimms and can thoroughly vouch for how amazing it is! 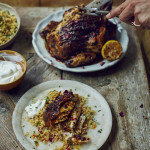 So excited Georgina is sharing her delicious recipe for Roast Harissa Chicken (click on the link below) with all you wonderful people! Also ONE lucky reader can win a copy of her book Stirring Slowly along with a selection of spices! All you have to do is subscribe to this website AND leave a comment below telling me what your favorite Indian curry is? If you have already subscribed to the website make sure to leave your comments in the box below. Winners will be announced on the 17th of July 2016. The competition is open worldwide. Looking forward reading your comments and announcing the winners. Good luck everyone! I like a good lamb rogan josh. It must be served with basmati rice and a cucumber, pea and mint in yoghurt sauce. It’s actually what I had tonight. Thank you for the competition. Stirring slowly looks lovely! It’s hard to choose but my favourite curry is butter chicken, so aromatic and comforting. My favourite recipe has to be your Vankaya Pulusu – it’s honestly the best curry I have ever made, missing them tastebuds so much! I have so many favourite Indian curry recipes! But my favourite has to be your Palak Murgh! It’s delicous, comforting & healthy! My favourite is Methi Murgh!! Delicious! And OMG, the thought of No Churn Chai icecream ? Nothing can replace the sense of satisfaction that a good Biriyani brings. It is one of those recipes that tends to be different with every family, and ever restaurant. A bit like the Nepolitan pizzas, the skill of which is handed over to the chosen ones. I absolutely love the lamb Biriyani with the luscious gravy at the Chandni Chowks of Hyderabad and have done solo trips in the past to have some and bring some back home to Mumbai. If there’s one recipe, it has to be a lamb Biriyani! Has to be Korma for me! Right now it is for sure it is channa masala ( chickpea curry). It’s easy, filling, inexpensive to make, and my girls love it! I’ve been perfecting my recipe so that I could make it for my sister’s birthday dinner, which I did last Saturday, and it was a great success! I love my Paneer matars, Chicken masalas, chingri malais, hyderabadi dum biriyanis, etc. But after a long day when I feel low and drained, I always love to be comforted by a hot bowl of dal with ghee and plain fluffy rice. It got to be Dal for me. It’s technically not a curry, but I ABSOLUTELY ADORE your chicken pulao! 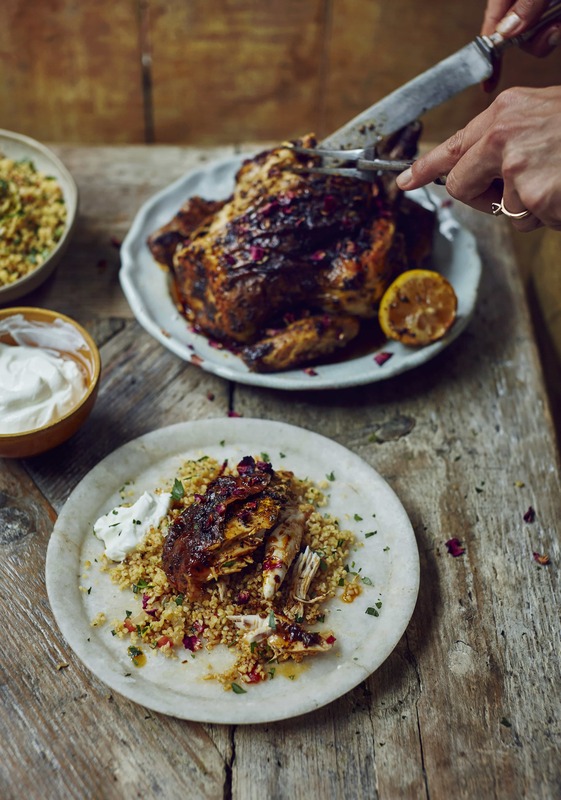 I’ve made it tons of times over the weekend to keep my husband and me going till Tuesday evenings – and have sent it to loads of friends who either don’t like spending too much time in the kitchen or love a quick biryani/chicken pulao! Also I LOVE Georgina’s Instagram page – would love a copy of her book!! Love your butter chicken recipe, even my husband enjoyed it (he sually doesn’t stray too far from chicken korma). Love chicken curry! btw, I am an ardent follower of yours! love your instagram feeds and all your recipes esp.kashmiri aloo paneer jalafrezi, Dal tadka , chole! recently bought your book too. love the designing of the book . your maharashtrian and gujarti cuisines are awesome ! thank you for spreading the love ! I have to say that I love making saag paneer at the moment, but I do enjoy experimenting with new Indian recipes so would welcome a lovely book with new ideas! My favorite is bagare baingan all variations of the dish! After a long day i do enjoy making khichadi kadhi, simple delicious and kids love it. With my 12 year old daughter taking interest in cooking and baking I am always looking for new ideas. Couple of my favourite Indian curries amongst so many, are egg curry and saag paneer. I am constantly trying out the different types of egg curry recipes from across the different regions of India and have loved them all. The south keralin curry was a hit – I even fed it into an Indian man and he new what area it was from without me telling him – I was amaZed and so glad your recipes are so authentic! Thankyou – they are all wonderful!!!! It would be so hard to pick a favourite but for me, India is all about lentils and the zillion ways we know how to make it tasty and heart warming across the length and breadth of the country. A single favourite? With biryanis, vindaloos, and all the rest out there? That’s pretty much impossible – I can at best say which one appeals most right now. And that would be Keralan chicken curry – not overhot, that ruins the flavour, but just spicy enough to warm the mouth and stomach, with those rich flavours… And a nice, hot naan of course! Do I have to pick a favourite – I love all of them! My family’s favourite Indian dish is your wonderful Butter Chicken, Maunika! I have tried many recipes and believe yours is the most authentic by far.My copy of Indian Kitchen falls open by itself at page203 which is starting to look a bit worn and tomato-splattered! Ooh I make a very basic spinach and chickpea curry which tastes lovely and fresh but I could do with some more ideas. Just come accross your recipes and they all look amazing! Favourite? It’s a toss up between Chicken Tikka Masala and Rogan Josh. It is a big deal in my household, we also make cucumber raita and homemade naan bread. It’s one of the few dishes that I can get the kids involved in! Kashmiri Khatte Baingan!!! Love to have the vegetable in the curry. Super delicious and healthy too!! Thank you everyone for your wonderful comments and all the love for the recipes from the site and book! So excited to announce Divya Sehgal is the winner of a copy of Stirring Slowly and a little hamper of spices! Was looking for the “like” button haha. THANK YOU!! Beyond happy!